One of the hardest lessons I've been learning through this stage of my life is when to hold on, and when to let go. As life moves on and the journey continues, the "rules" change. What seemed to need all my time and attention has passed and I'm at a new and different phase of life where I have needed to renegotiate my priorities. This can look a little bit like a midlife crisis, or we can turn it around and look at it as a new adventure. 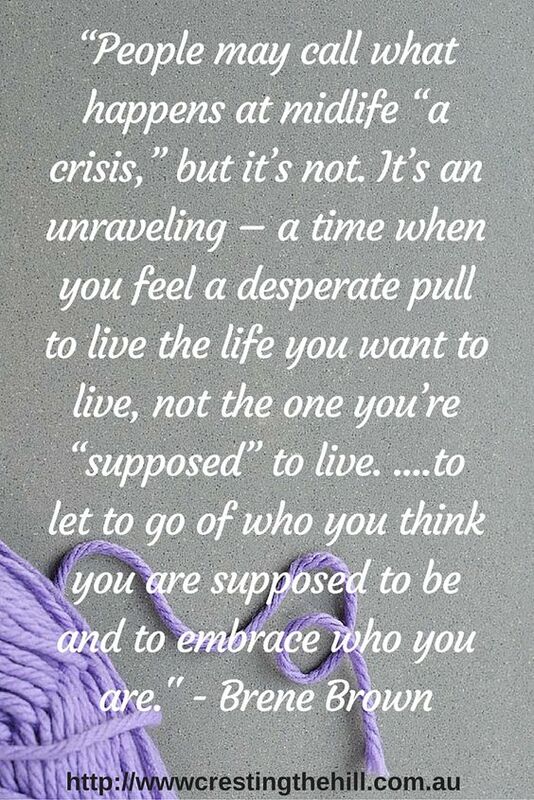 Brene Brown calls it an "unraveling" as you let go of expectations and embrace the life you're living. When I was younger I could hold on to my children and influence their decisions and their lives. They looked to me for guidance and to keep them safe. Now they are grown and flown and out in the big wide world and they rarely need any input from me. It can be hard to remember to pull back and not offer that unsolicited advice that I am so sure they need. To let them go and to not feel bereft as a mother - to trust the parenting we gave them and free them to be the people they were created to be. 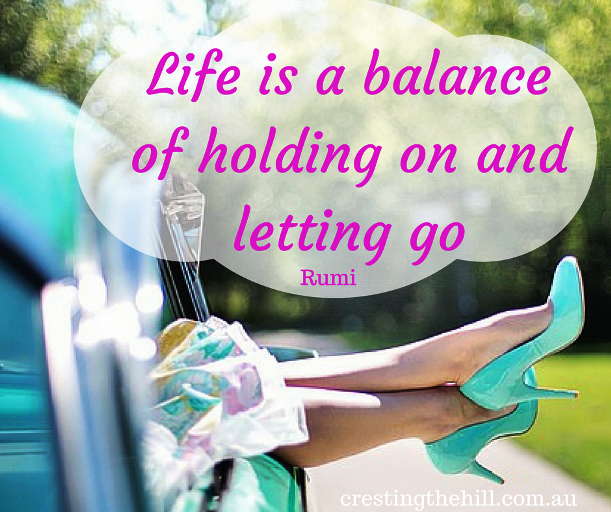 Letting go is part of the parenting journey - those who hold on too tight for too long often come to regret it. I have friendships that I thought were indestructible and I worked hard at holding on to them for decades (and that is a VERY long time!) only to realize they are not really friendships at all anymore.We have moved on in different directions and don't have a great deal in common now. Rather than working harder and harder to hold on to these people, I am coming to the realization that I can acknowledge they have run their course, and gracefully let them move out of my life and use the opportunity to be open to new friendships. On that note, I am also realizing that new friendships are hard to come by. I used to make new friends all the time - through playgroup, school mums, church, work etc etc. Now I don't have those same social circles and it's harder to meet like minded women. This is where blogging has taken on a life of its own, the friendships and connections all over the world have added a new dimension to my life. It's easier to let the old go when the new is so interesting and engaging. I've also needed to learn to let go of my husband - not in the sense of an open marriage thank you very much! But in the sense of not expecting him to be my chief source of entertainment. As my circle of friends decreases and my children have moved on, he has become a much bigger part of my life again. It's lovely to reconnect, but not to feel the need to strangle him with my need for time or attention. Although he has always been the closest person to me, that doesn't mean I should be looking to him to fulfill all of my social needs, and (seeing he is an entrenched introvert) this is an incredible relief to him. It's been a process of finding the balance between time together and not expecting him to be the provider of my happiness. I have seen marriages suffocate when the wife holds on too tightly to her husband in the hope he'll compensate for her empty nest and lost fledglings. We can't expect one person to create our happiness for us and holding on too tight can actually push them away. We need to renegotiate our boundaries and our expectations, holding on with a tight fist isn't the answer, it can be toxic and creates a slow death for any relationship. Back in January 2015 I chose "Release" as my word for the year and this still comes into play in my life 18 months or more later. It is about learning to let go of things and people that are no longer good for me. Trusting that better things are in store, and finding sufficiency in myself rather than looking for it in others. Holding on to what is important but not grasping it in a needy way. Midlife is such a learning curve for me - one where I can let go of old habits and unnecessary obligations and fill those places I've freed up with new and interesting pursuits. This is so unbelievably powerful and spot on. 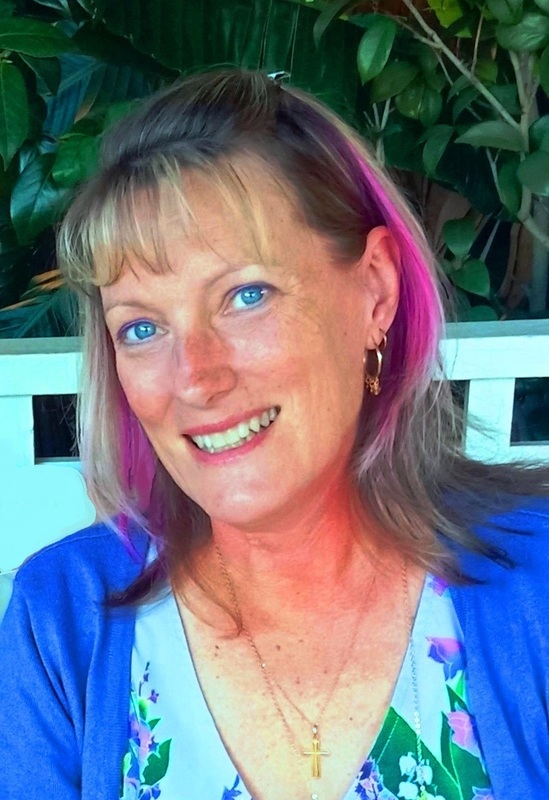 From the unraveling to the letting go of the husband – – all of it. For me mid life is about finding that sweet spot between effort and ease. What we gain is often deeper and more special than what we lose - each season has its own sunshine - and I wouldn't swap my adult children for them being young again. Very thoughtful post... The unraveling idea is an interesting one. I feel that in the sense of letting go of expectation, but I also feel more curiosity and awareness. Thanks for getting my morning started with a smile. 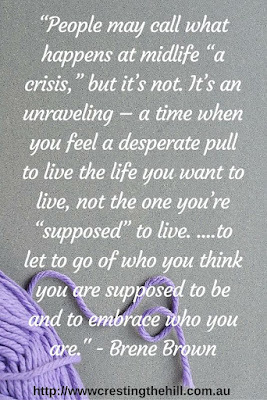 thanks Margaret - you're right about the whole unraveling idea - but I think it holds a lot of truth because midlife is a time for letting all those preconceived ideas go and embarking on some new paths ahead. Great observations -- all true and a natural part of life. Thanks for laying this out so clearly. Thanks Shari - it's what life is all about isn't it? We just need to accept it and enjoy the process. Yes, yes and yes. I have felt all of these very same things. 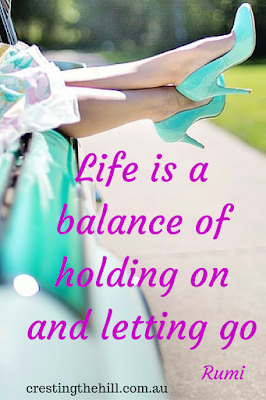 Letting go is never easy but until we do it we will be stuck and unable to move forward. I love this concept and this post. It''s really true. Release has always been hard for me, though. I'm still a work in progress. Me too Carol - I had a favourite song called "Let it Go" by a Christian Band that really spoke to me for a long time. When I heard it again recently it was less powerful, so maybe I'm getting there. Your notes about friendship reminded me of a comment a college friend made, sitting at a table with all of our college friends at my daughters wedding (sorry for the sentence structure, still early, not enough coffee). She said "we don't have time to make any more life long friends, so we have to work with what we have." That's so true Kim - investing in those that have hung with us through thick and thin is so important - and the shared history is really special. I'm still open to new friends though - even if none seem to be on the horizon! Every word is true, and certainly applies to most of us! Well said. Thanks Tam - I think there are lessons here that we've all learned over time. I was just admiring your hair in your profile pic Lisa - it certainly suits you and I think anyone with self-confidence looks better when they look like themselves. It's funny you said "embrace" because that's my word for 2016 - we seem to be on a similar journey! Hi Kimberley - I love Brene too - she just grabs me with how she sums up things I've been dealing with. I can't imagine being single at 56, but I would cope and unravel and reknit - just as you are. We are often stronger than we give ourselves credit for - and life goes on - we choose to wallow or we choose to thrive - I know which one I'm going with!